Dirty Linen Magazine (US) April, 2001 - Review of "The Salmon's Leap"
I'm really surprised that the work of fiddler Randal Bays isn't better known. Few players have his subtle and warm touch. His playing is light and fluid yet still has a sense of power and passion. He's simply a joy to listen to. All the tracks but two (which were taken from a live concert) were recorded in his home and retain a comfortable, relaxed feeling. With the exception of the slow air that closes the recording, Bays is backed by either guitar, cittern, flute, or piano, and on the live tracks he is joined by accordionist John Williams. The tunes are a mix of traditional and self-composed, along with a couple of O'Carolan pieces. There are also two solo acoustic guitar pieces that show he's as good a guitarist as fiddler. This is traditional music, pure and simple, the way it was meant to be played. Fiddler Magazine (Nova Scotia, Canada) - Review of "The Salmon's Leap"
The Irish Voice (New York), - Review of "The Salmon's Leap"
The climate in the Pacific Northwest has a great resemblance to that of Ireland. Maybe that has something to do with the proliferation of Irish traditional music in Seattle, Washington and Portland, Oregon, two cities with a great wealth of local and imported talent. Fiddler and guitarist Randal Bays of Seattle is one of the best players in the region (or in the country for that matter). Still best known to many for his beautiful guitar accompaniment on fiddler Martin Hayes' early recordings, Randal is himself a marvelous fiddler. He proved this on his first solo disc, Out of the Woods and on Pigtown Fling, a duet album with harmonica player Joel Bernstein. He proves it again on his latest disc, The Salmon's Leap. Randal's fiddling can be compared to that of such contemporary Irish-born masters as Martin Hayes, Kevin Burke and James Kelly. He's got the technique and the taste to merit mention in such company, and if you like their recordings, you'll like Randal's. Extra added attractions are duets with ex-Solas button accordionist John Williams and harmonica ace Bernstein, as well as two finger-picked guitar solos. Folkworks Magazine (US) - Review of "The Salmon's Leap"
"The Salmon's Leap" is a pure gem, an essential find for lovers of Irish traditional music and stands proudly with similar albums and artists from Ireland. I would highly recommend this CD. Looking for a new CD of Irish Traditional Fiddling to throw into the burner? Have you searched the local record shops and overseas web sites for a new find? Nothing much new in that category out of Ireland right now? 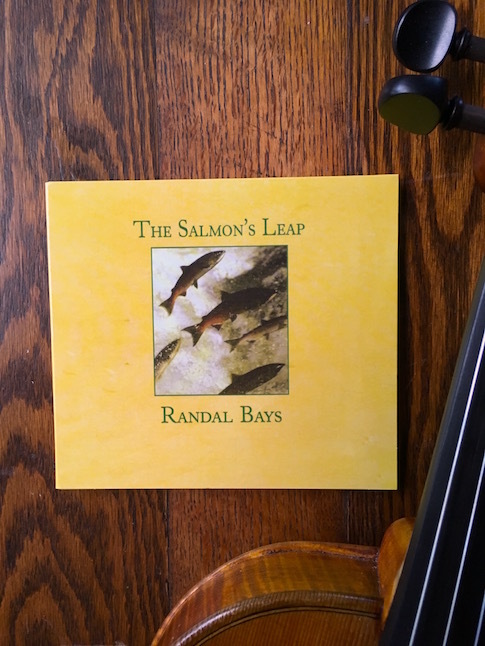 Look no farther than our own backyard in the Pacific Northwest to find the new CD "The Salmon's Leap" by Fiddler/Guitarist Randal Bays.Randal Bays second solo CD "The Salmon's Leap" is a pure gem in the category of East Clare fiddling. Fourteen of the sixteen tracks were recorded in Seattle, Washington between June 1999 and June 2000. The other two tracks were recorded "live" with ex-Solas accordion player John Williams in September of 1999 in California. The studio tracks feature an impressive line-up of musicians which include Gerry O'Beirne-Guitar and Ukulele, Dave Marshall-Piano, Leo McNamara-Flute, Joel Bernstein-Harmonica, Stanley Greenthal-Cittern, Dan Compton-Guitar and Duke Whitehead-Cittern. The wonderful variety of tracks on this CD contain not only the usual sets of traditional reels, jigs, slip jigs, hornpipes, marches and slow airs, but also original tunes written by Bays, plus three Baroque style pieces by the legendary Irish harpist Turlough O'Carolan. Another obscure Baroque style track included is called "Molly St. George", written by Thomas Connellan Born 1640 ), a Co. Sligo, Ireland harpist and composer who preceded O' Carolan by a generation. Other tracks on this CD worthy of mention are: O' Carolan's "The Princess Royal" where Randal's expressive fiddle is joined by guitarist O'Beirne in a lively, yet reflective arrangement of the famous tune. The traditional set of reels that include "The Shores of Lough Graney" and "Ormond Sound" feature the great accordion-like harmonica playing of Joel Bernstein. Randal is also joined by Gerry on guitar and Duke Whitehead on Cittern for the set of jigs that include "East of Glendart" followed by the famous Tommy Peoples standard "The King of the Pipers." Randal's other musical life as an excellent guitarist is represented on two tracks, the first being a very contemporary and beautifully mesmerizing arrangement of the emigration slow air " A Stór mo Chroí" and the second being another visit to the world of O'Carolan with the tunes "Maurice O'Connor" and "Carolan's Welcome", both upbeat and using DADGAD guitar tuning. Still more tracks to note are the Bays written slip jigs set called "The Golden Gardens" followed by the CD title "The Salmon's Leap", plus another great set called "The First Hard Rain" and "Ryan's Rant." This fabulous CD closes with the thought provoking slow air written by Bays called "Lament for the Great Forests" which commemorates the great Oak forests that once covered Ireland, and the similar destruction to the great forests of the Pacific Northwest that is occurring today. I would highly recommend this CD. A few years ago (in another life it seems) I went to Charlotte, South Carolina to hear the legendary fiddler James Kelly. Someone I had never heard of was with him and I assumed that the concert would be "legendary fiddler plus guitar accompaniment." Wrong, as usual! The concert was mostly two fiddles and several times I was transfixed: the beauty was so deep that I found it hard to breathe. I thought that if the birds outside heard this they would forget to move their wings, and fall out of the sky. It was a concert I will never, never forget. This month I learned a lot more about Randal Bays. I picked up a copy of The Salmon's Leap, a CD released on his own Foxglove Records last year and boy, am I impressed. I bought it four hours from here and listened to it all the way home. And it made the drive a joy, even when I got lost. His playing on the 16 tracks (mostly fiddle, some guitar) is a wonderful combination of careful and relaxed, and the technique behind it all is as good as anyone I’ve heard. He doesn’t exactly sound like any fiddler I know; if pressed I would say that he takes strong elements from James Kelly (the older, pre-guitar sound with scales and notes that aren’t quite the same as a standard classical scale) and from Martin Hayes (the ability to sound so natural that you think he is playing the fiddle with no more effort than he uses for breathing as well as some of that heart-breaking snake charmer sound that Hayes has). Yet I don’t feel comfortable making these comparisons for somehow Bays’ sound is all his own and he seems to carefully tune it for each different cut The tunes were recorded over a year in Bays house in Seattle, a little "off the cuff," he says, as "one by one the musicians dropped by, played through the tunes a couple of times and sat down in front of the microphones." He must have quite a set of microphones at his house as the sound quality is excellent. Like the whole CD, it is both extremely live and extremely quiet, not in the sense of soft, but in the sense of calm. Even when the music is faster and more overtly passionate, it stays tuneful and quiet. Those musicians include Gerry O’Beirne (guitar and uke), Dave Marshall (piano), Leo McNamara (flute), Joel Bernstein (harmonica), Stanley Greenthal and Duke Whitehead (citterns) and Dan Compton (guitar). There are also two cuts recorded in concert with Solas' former accordion player, John Williams. Tunes on the CD include traditional hornpipes, jigs and reels (Green Grow the Rushes, The Maids of Mount Cisco, Woman of the House), airs (A Stór mo Chroí, Molly St. George) and O'Carolan compositions (his Welcome, The Princess Royal) and his own compositions. Bays is a fine tunesmith; he writes well in the old style, especially in the album’s eponymous slip jig and his march, The Ninety Eight, a tune that keeps popping into my head at odd times. This is a first-rate and excellent package of fine music played wonderfully by a musician with extraordinary talent and grace. Combined with the tunes and musicians, this makes it a must-have for Irish music lovers. Tradition Magazine (UK) - (by Judith Gennett) Review of "The Salmon's Leap"
Randal Bays is from the Pacific Northwest and plays Irish fiddle and guitar in an elegant, effortless style. The Salmon’s Leap contains some tunes that are traditional, some authored by Bays in traditional manner. The album, though recorded in Bay’s Seattle living room, is a good example of simplicity, of isolating instrument...or instruments yoked together...for the beauty of their own sound. Here the sound is sweet and warm, and though deft, Bay’s playing is never harshly quick. The style has been compared to that of Martin Hayes, whom Bays has backed on guitar, but is not so based on dramatic upward slides and seems more straightforward; the invisible fingers are always moving but the emphasis is on sweetness and richness rather than action. Perhaps the nicest tracks (sets beginning with “The Ragged Hank Of Yarn” and the deceptively American-sounding “The Gypsy Princess”...based on Kerry fiddling) on The Salmon’s Leap also feature Chicago ex-Solas button accordion player John Williams. Bays and Williams play together as if they were twin brothers, often almost indistinguishable. Bays’ fiddle is also variously accompanied by the guitar of Gerry O’Beirne, and perhaps piano or flute. The piano-assisted dance tunes, for example the Irish “Mary Claflin’s/The Noon Lasses,” sound the most measured and “traditional.” His guitar playing may be heard twice on one slow air, “A Stór Mo Chroí,” and on two O’Carolan tunes, stately and measured, but with a contemporary twist. Bays compositions for the most part do sound like they’ve leaped from The Emerald Isle rather than the San Juan Islands, but his images are local, for instance he pairs “The Ninety-Nine” about the WTO boycotts in Seattle in 1999, with “The Ninety-Eight,” a traditional tune about the Irish Rising of 1798. Another of his originals, “The Salmon’s Leap, ” closes the album and is a dirge marked by pretty, subtle droning, upslides, and graces. The tune mourns the disappearance of the old forests both in the Northwest and in Ireland.